Ali and Shane are amazing helpful people, Ali put me in touch with a removalist to take my items from Brisbane to their Storage. Arranged for me to meet with the removalist and view the storage space, they could not do enough to help my move back to Vic easier for me. Can highly recommend two very professional people, who care about their customers. I would recommend Storage King Delacombe. Shane was great to deal with. When I had a few complications he was understanding and there was understanding, not pressure. Thanks again for your service. Delacombe Storage King has a fantastic and kindly manager that explained the entire process of acquiring a storage unit, discussed my size needs and helped me choose the best service at the best price. The facilities are amazing, and include toilets, and for me personally, the opportunity to access my belongings from early until 9PM is really great for the hours I work. I highly recommend this service! Very easy and friendly to deal with, I love their get 1 month free offer! Staff are friendly, willing to help & I received great service with a smile . The people are truly caring people. I've had some of my precious belongings at the storage shed their for a while now. I feel at ease knowing that what I treasure is safe. Always greeted with with a cheerful smile. Thank you for your understanding. Fantastic service! Both Shane and Ally have made my storage experience straight forward and stress free. Highly recommended. Thanks so much guys! Very helpful staff and they provide excellent facilities. Never had an issue with access or alarms and always found my possessions as I left them. Can't ask anymore than that! Super helpful over the phone and in person, great website and packing materials, worth every cent. Recommended. Wonderful customer service, friendly staff & clean & maintained units. Ali was very helpful & friendly which made everything a lot easier for me. Nothing was a problem to her & she even stayed past their closing time to show me the units & explain everything to me. Fantastic customer service! The storage units are great... very clean, easy to access when you need to & totally secure. I would highly recommend Storage King Delacombe to anyone looking to store their belongings. Very good experience, glad we chose storage king. Contract in the name of Tim Clarke. A great place. Staff very helpful. No problems changing to a smaller unit when we had less 'stuff'. I have been using this storage facility for over ten years. Very secure and well maintained. Staff always pleasant, efficient and helpful. Thank you! Fabulous staff, secure and immaculate units at good prices. I've been using this facility for roughly a decade and can't find fault. Highly recommended. Top notch staff. Brilliant customer service. Highly recommend. Saved me an absolute fortune. Will always use Storage King Delacombe. Storage King Delacombe are fantastic! Ally has been more than helpful, friendly, and provides a great service at a reasonable price. Use these guys for your storage needs! I found Storage King Delacombe had a great monthly price.I experienced friendly customer service and found it easy to access. It's a very secure and clean storage facility. We had an excellent experience at this Storage King. The friendly staff were happy to help us out, show us the different types of storage options, lend us their enclosed moving trailer, and help us out with boxes. We got a great deal. Security in a convenient location for us. Couldn't ask for better!! I highly recommend Delacombe Storage King. Venue is close to town, secure and easy to access. Unit is dry and clean. Staff are friendly and helpful. No problems recommending this organisation at all. I am currently storing a room full of things at Storage King Delacombe. When I created an account with them, the Manager was lovely and very friendly and helpful. The unit is easy to access, great value for money, and I feel my belongings are safe. I'm very happy I chose to store with Storage King Delacombe, it has been an easy and simple transaction, and I would definitely recommend them. We've been using Storage King for our business' storage needs for the past four months - the staff have been great, very accommodating and go out of their way to help, the facility is secure and the hours of access make getting what we need in and out very convenient. Great location, secure, great hours for access. Would happily recommend. We required storage in a prompt manner and the staff at Storage King Delacombe were courteous and obliging. The venue was accessible to our needs and secure to ensure confidence. Professional service all round. 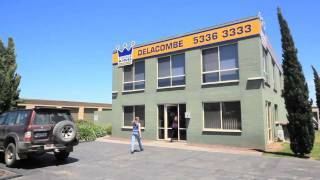 One phone call to Storage King Delacombe is all you need to relieve the stress of moving house or storing business records and files. Our professional and courteous staff ensure your goods will be stored in the most secure, convenient location in Ballarat. Storage King Delacombe proudly services Ballarat, Delacombe, Sebastopol, Redan, Smythes Creek, Newington, Alfredton, Lucas, Ballarat Central and Ballarat City.